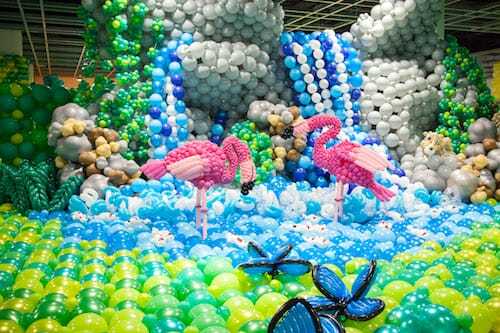 With the help from more than 20 International Balloon Artists and dozens of Australian Artists and volunteers, the team will construct the largest Enchanted Balloon Forest ever created in Australia. The exhibit is open to the public for 3 days only. Why an Enchanted Forest? Miss Donna & Mr Jay are getting married!! Miss Donna and Mr Jay are local Sunshine Coast Balloon Artists with a passion for their craft. When they decided to get married they set out to make the most incredible wedding venue they could imagine - An Enchanted Balloon Forest. Using more than 100,000 bio-degradable latex balloons in its creation, the forest will include dragons, unicorns, mermaids, fairies, waterfalls, caves and mystical forest creatures. There will also be six full BALLOON DRESSES - The bride's dress, four bridesmaid's and one flower girl's dress. The balloon dresses will be worn for their private ceremony and then placed on mannequins for display in the forest. 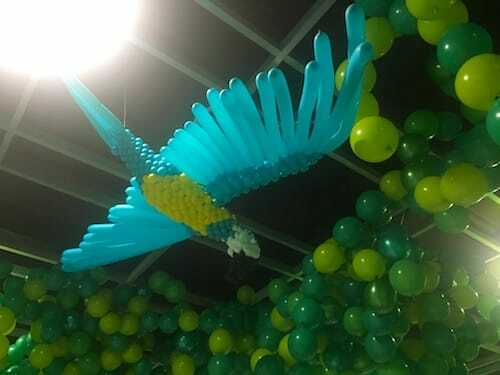 Balloons are NOT plastic - they are made from natural latex. The project is fully contained indoors and the latex balloons will be disposed of properly - protecting our wildlife and oceans. awareness on the impact of balloon releases on the environment. And No helium will be used in this project. The photos on this page are from the World Balloon Art Festival 2017, Xiamen, China. Produced by AEMI, Artistic Director Guido Verhoef.